We’ve just launched big new improvements to the Messages page in Telerivet — including one of the most-requested features of all-time: full-text search! Telerivet finally has a search box! You can easily search for words in the text of any message, as well as contact names. You can also combine full-text searches with other filters, such as date ranges, labels, or message status. It’s blazing fast, too. Even if your project has a million messages or more, the search box usually finds results in a fraction of a second. The first time you use the search box, it may take a few seconds for Telerivet to add your new messages to the search index. After that, your searches will be much faster. One common way of using Telerivet is to keep the Messages page open in your web browser, and respond to new messages as they arrive — for example, to provide customer support over SMS. But until now, if you’re not looking at the Messages page all the time, there hasn’t been a good way of getting notified when new messages arrive. Now, you can optionally enable two kinds of new message notifications: audio notifications and desktop notifications. With audio notifications enabled, Telerivet will play a chime whenever a new message arrives while the Messages page is open. If you enable desktop notifications, Telerivet will show an alert on your desktop that you can see even if you’ve switched to another application or browser tab. And as a extra bonus, the title bar of your Telerivet browser tab now shows the number of messages or conversations in your current page, to make it easier to notice new messages even if you’ve switched to another tab. Desktop notifications currently work in recent versions of Chrome and Firefox, but are not yet supported by Internet Explorer. Audio notifications work in recent versions of Chrome and Firefox, as well as Internet Explorer 9 and above. To enable these notifications for your account, head over to your Personal Settings page. Telerivet has always supported labels for organizing your messages, but until now adding labels to outgoing messages required two steps: first send the message, then add the label. If you’re sending a lot of messages at once, this can get a little tedious. Fortunately now you can add labels to your outgoing messages right when you send them. In the “New Message” dialog, just click the “Labels…” button. Similarly, you can also add labels when importing messages to send from a spreadsheet, and when scheduling messages to send later. We all make mistakes. Every once in a while, Telerivet gets a panicked support request from a user that accidentally deleted hundreds or thousands of messages or contacts. Since Telerivet makes frequent backups of all user data, it has always been possible for us to restore deleted data from backups, but that process takes hours of manual work, and the last few hours of data would be lost. But now, every Telerivet user can save their own bacon. When you delete messages, contacts, or many other items from your Telerivet account, Telerivet will keep them in your “trash” for one week before permanently deleting them. 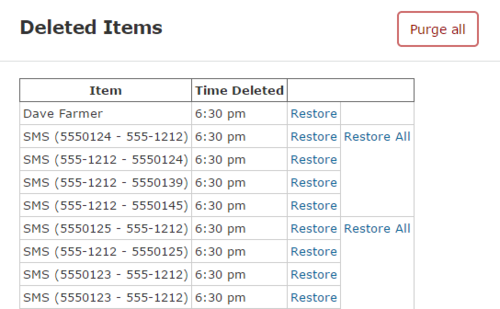 If you realize your mistake immediately, you can click “Undo” at the bottom of the page to restore the deleted items. If you want to undelete data after the “Undo” button goes away, simply go to your Dashboard page, then click More > Restore deleted items. Then you can browse for the items you want to restore. To try out these new features, head over to your Telerivet account, and let us know what you think! Thanks also to the many Telerivet users who suggested these new features! If you have any suggestions about new features that would make Telerivet even better, send us a note at support@telerivet.com .